Thinking about using a big site like Ajiras can be intimidating. So let me tell you this right now, working with Ajiras is nothing like other complicating and bulky site. Ajiras is straight forward, easy, fast and very useful. From registering, posting your first job to communication with buyer. Nevertheless, we would like to show you exactly what we mean by straight forward. Here is a how to guide on posting your first job/service online. Posting on Ajiras is simple, you just follow the on screen instruction providing information on each filled. You are required to register as a seller to do so though. Find out more about registering in ajiras here. Remember Sellers can post and sell jobs/services and can also buy other seller’s jobs. Buyers can buy services but cannot sell. 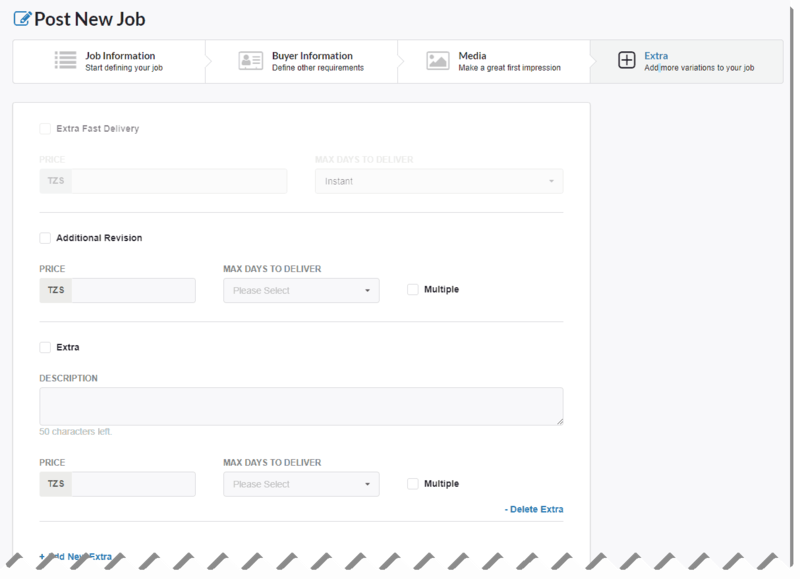 This is where you add information about your job starting with Job Tittle, Price, Category, Sub-category, Description and Tags. All fields are mandatory except Tags. Even though tags are optional, we highly recommend you to add as many tags as possible. Job Title – Right the job or service you are offering. This is what user sees in job listing. Make it meaningful, on point and less than 80 characters. Example: I will design a beautiful logo for your business. You can write it in any language you like. Remember text are not translated, so use the language that you believe many people will understand. Job Price – Enter the price for you job. It’s mandatory. If your job price is not constant write the average price and tell buyers in description to contact you using Ajiras inbuilt messaging to discuss the service before ordering. Packages – Complex jobs can use package feature to write 3 different prices including a description of what they will get and not get with each price. Buyer will choose what they need. Click here to find out more on how to use package feature. Description – Provide as much details as possible about your job here. Buyers need to understand exactly what they will get when buying your job. Jobs with little or not enough description will be approved to be published on Ajiras. Tags – These are words that describe your job/service. If you are job is about logo designing then your job tags can be logo, design, and logo design. Tags are used by Ajiras to provide search result to buyers, meaning when a buyer search for a word ‘logo’ Ajiras will look for jobs that has logo as a tag and show your job to the buyer. Buyer Information tab is used to fill instructions and information intended to get necessary information from the buyer for a success completion of the job. This tab has the following fields to be filled. Instruction to Buyers – Write what you need from buyers for you to do the work. This helps the buyer to know what is needed for you to be able to provide the service. Max Days to Deliver – Write how long it will take to complete the job after order is received. You need to be very careful on the number of days you choose. If you fail to deliver the job within the number of days you wrote here, buyer can decide to cancel the order and you will not be paid. 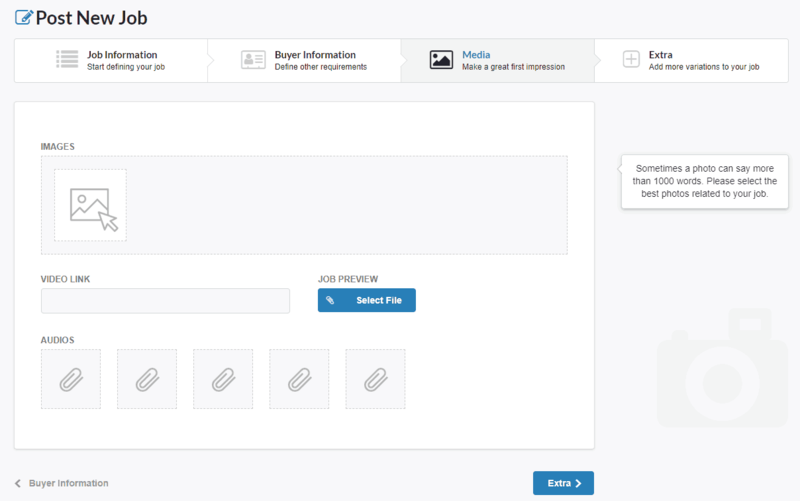 If you choose Instant make sure you upload instant delivery files for buyers to download once they order your job. Requires Shipping – If you charge buyers for delivery, please add the amount you charge here. On the order page, buyer will not be able to opt-out of shipping cost. It will automatically include in the job price. Let’s Meet – Let buyers know that the job requires to meet for it to be completed. These means the jobs requires you to be onsite to do the jobs. Example; construction, plumbing, wiring etc. Once let’s meet is selected, you get an option to enter distance in km you are willing to meet from the location you entered. Location – Enter the address/location of where you are or you do your work. Display Map – Choose whether or not to display map location of your job. First impression is very important to be able to sell. Upload all the necessary files for you job here. Images – Upload up to 10 images about your job. Maximum image size 1 MB each and minimum 350px * 200px. Your images are the door to your service. Choose good images. Video Link – You can put your YouTube image links to be shown on your job. Again, quality is important. 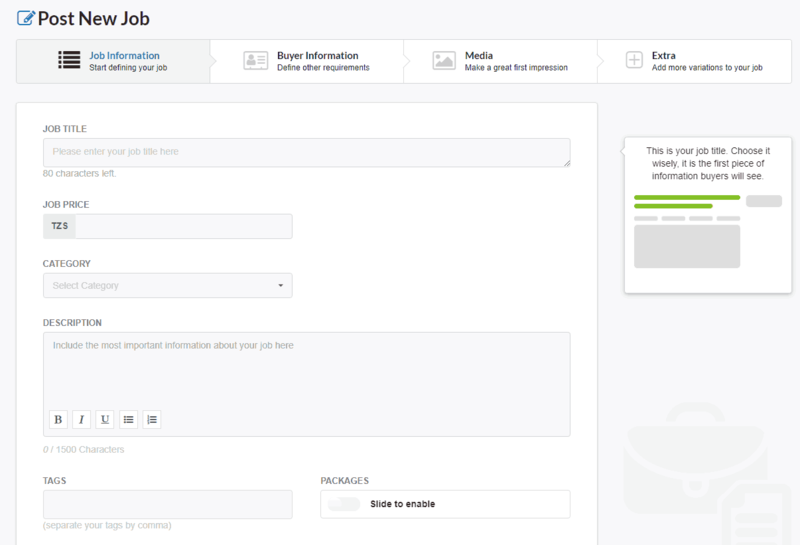 Job Preview – If you have sample files for buyers to preview before purchasing you job, you can upload them here. Audio – If your job requires audio, you can upload up to 5 audios here. Each audio can have a maximum of 3MB. Please be respectful and considerate. Usage of inappropriate medias like images and videos will result in immediate ban of your account. You should also respect other peoples works, don’t post images that are not yours to avoid issues with copyright and possibly account bad and lawsuit. 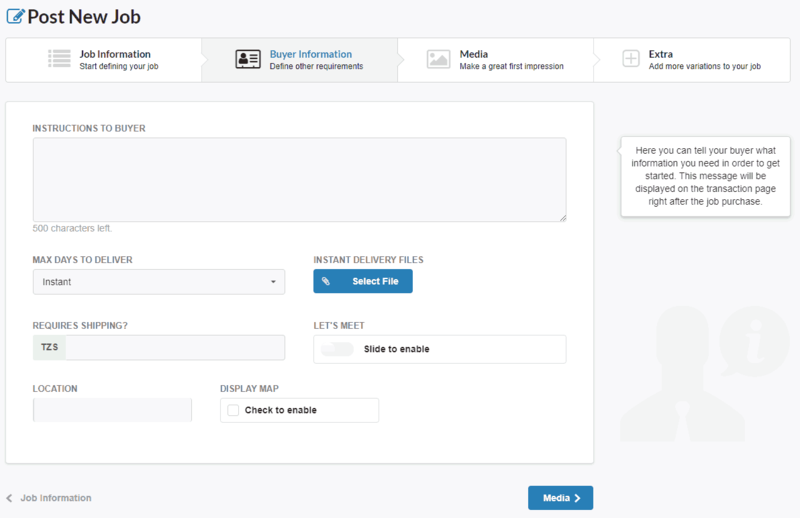 Extra Fast Delivery – This allow you to add an option and charge buyers when the want their order to be completed faster than the delivery time you filled in buyer information tab. Additional Revision – Buyers are allowed to request for revision when you deliver the services. This is of course if the revision asked is within the scope of the agreed order. You can charge buyer for extra revisions when free revision are exhausted. Extras – Are services that can be purchased alongside the job purchased. Here you write extra services which buyer might need on top of the standard service you offer. Example; you can be providing service of Preparing and writing of business plan as a standard service. Extra services can include printing of the business plan, lamination of the top page and binding. You can set price for each of the extra. We recommend to go through your job and make sure everything is okay before you click Publish. Once you click publish, your job will sent to Ajiras Team for review. If approved you will receive an email notification and your job will publish and ready for buyer to buy. Otherwise you will be informed of the rejection and why. Make the necessary changes and publish again. NOTE: You can only sell services in Ajiras. Selling of products like phones, cars, etc. is not allowed. By doing so, your job will be rejected.